After a series of life events, marriage, divorce, finding love again, a miscarriage, the birth of three children, and leaving a job she loved to become a stay-at-home mom for her three children – including her oldest son who is on the severe end of the autism spectrum – Melinda Bowens (pictured at right) wanted to create a company whose primary focus is uniting people through the power of storytelling. When Life began as a creative outlet for Bowens to release and reflect on parts of her life that have shaped her for better and for worse. Her original plan was to design apparel that ultimately would allow people to wear their feelings on their shoulder. But God had different plans. It became evident to Bowens that it is so restorative for your soul to remember those fond, happy, or seemingly humiliating times, and to let go of those that haunt or hold you back. That concept ultimately shaped the direction of When Life, a safe, value-driven platform that allows others to not only laugh and cry together, but to encourage and support each other. The website, www.thewhenlife.com, was launched in July 2017. Bowens said, “If you have had something happen that stands out to you as either a humiliating moment you will never forget or a time when your heart has been filled with pride or sorrow to the point of bursting, you are not alone. Bowens has nearly 900 followers on Facebook and more than 3,000 Instagram followers including people from Canada, Jamaica, the Philippines, and the Middle Eastern city of Dubai. She considers all of the followers to be a blessing as they stay connected through their stories. Future plans for Bowens include writing a book about the power of storytelling. At the present time, she will continue to help empower others through the When Life blog and through the sale of When Life products that allows people to safely wear their feelings. 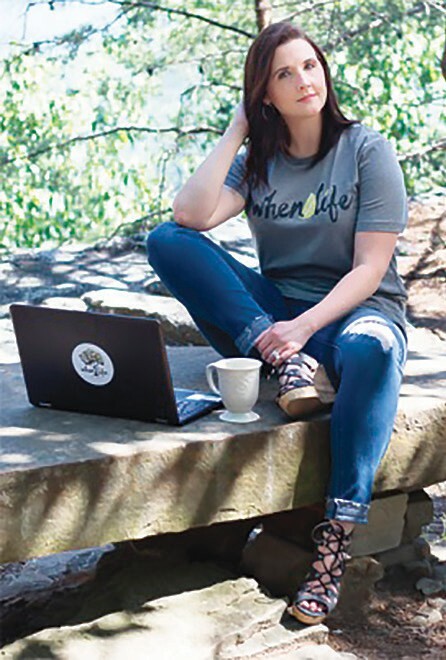 All shirts bear an icon from a dedicated story such as an anchor, a broken heart, or a lemon, while the decals, note cards, mugs, and hats portray the When Life logo.